Drainkleen Doctor uses only the latest, most effective location and repair equipment. We also have a dedicated program of maintenance to ensure our equipment is always in full working order. This focus on equipment is a critical part of our commitment to you – honest work at the right price. 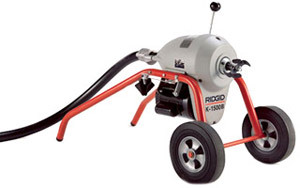 We employ the Rigid K1500B drain cleaner with 32mm steel cables. We also have a range of cutters, from 100mm root cutters, fat, silt and retrieval augers. We also have jet nozzles ranging from latest root mulcher to root, fat and silt jets depending on your requirements. We use the latest US Jetting 4018 high pressure water jet, which runs at 4,000 psi with an output of 80 litres a minute. This allows efficient and effective removal of obstructions. 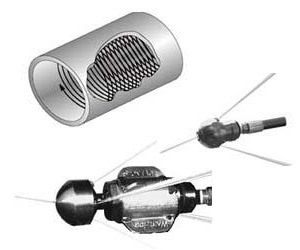 Our equipment includes the latest water jet nozzle technology including warthog, flushing nozzles and root cutters for pipes from 100mm to 450mm as required. We are able to access problematic areas, with a 150 metre jet hose reel available for longer runs. 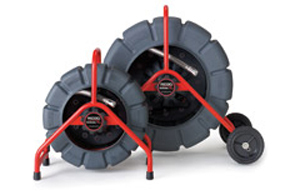 A remote hose reel allows the machine to be up to 150 metres away from the drain entry point. Clearing of commercial and larger sewer and stormwater drains from 100mm to 450mm. Longer runs of drain up to 150 metres cleared quickly and efficiently with full power to the cutter at all times. We can offer a root cutting capability not possible with smaller machines in longer runs and larger pipes. 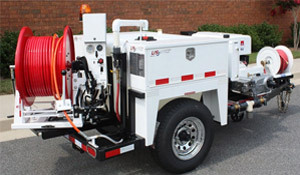 The large volume US Jetting machine is ideal for these applications. Silt and mud blasted from commercial sized stormwater drains. Latest colour drain cameras with self-levelling image suitable for 50mm to 300mm pipes. Easy viewing assists in ensuring the correct diagnosis is made on drain condition. DVD recorder with audio and high resolution screen. The format is clear and easy to view. The onsite screen allows viewing of the image in real time. Navitrac II locater tracks a transmitter contained in the camera. This allows the precise location and depth of the drain to be identified. You can excavate with confidence, knowing the exact repair location. 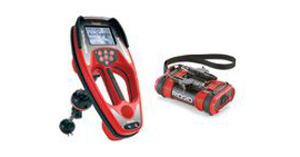 Rigid Navitrac II system, which allows for precise locating and depth of assets via camera transmitter or by conductive materials such as water and gas pipes and drain cleaner cables.